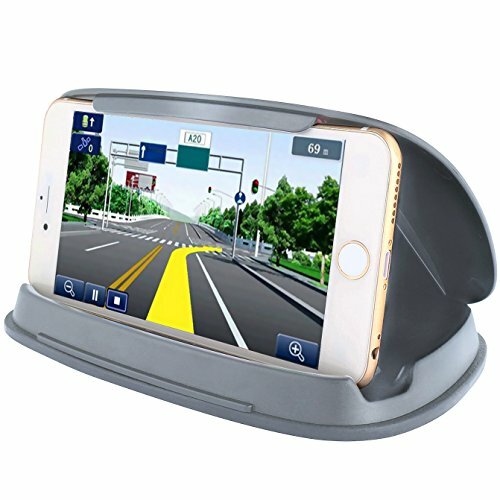 Compatible: All 3.0-6.8inch GPS navigator, smartphones and other handheld devices, such as for iPhone 7 / 7 Plus / 6S / 6S Plus / 5s / 5c, Samsung Galaxy S7 / Galaxy S7 Edge / LG / HTC / Nexus / Nokia etc. Features: 1. Designed without magnets, no harm to the device. 2. The holder can be opened or closed. When not in use, the lines on the surface is perfectly combine with car interior, and it can be used to keep parking cards or keys. 3. Universal Car Mount Holder can be installed easily and quickly. 4. The surface of the black matte of Stylish high-end design, comfortable and not dazzling. 5. Gel pad sticks is easy to clean. Do not leave residue on the dashboard. 6. High-quality and environmental materials of plastic together with rubber, long lifespan and aging resistant Notice: Applies to the vast majority of the dashboard, except some curved. Warranty and Customer service: We offer life time warranty for our car holder. If you have any problem with your purchase, please contact us freely and we will always be here to service for you.